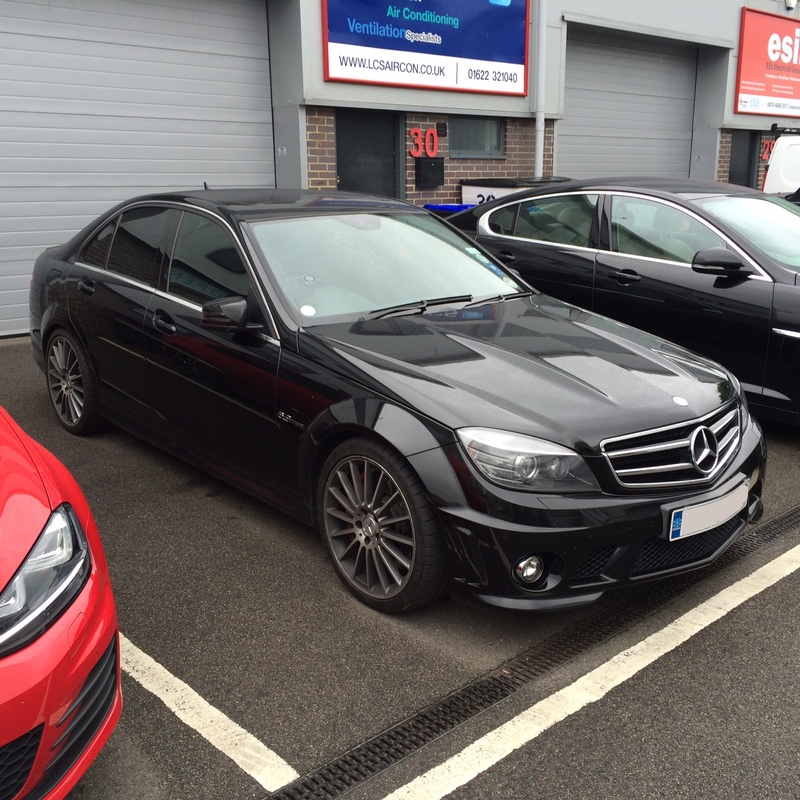 Today we’ve been performing development work on this stunning Mercedes C63 AMG. The car had previously been tuned elsewhere (Engine Remap only) and the customer came to us looking for more as he felt it wasn’t running to its full potential. Firstly we strapped the C63 down onto the dyno and performed a couple of 4th gear runs with our Lambda probe inserted into the exhaust to get accurate Air Fuel Ratio (AFR). The results showed an AFR of 10.6 which is much richer than we would expect the car to be running. The next step was to flash our Engine ECU and Gearbox TCU performance software onto the car. Our C63 AMG performance remap software makes changes to fuelling and ignition along with torque limiters and shift strategies in the gearbox control module to provide some quite staggering results. 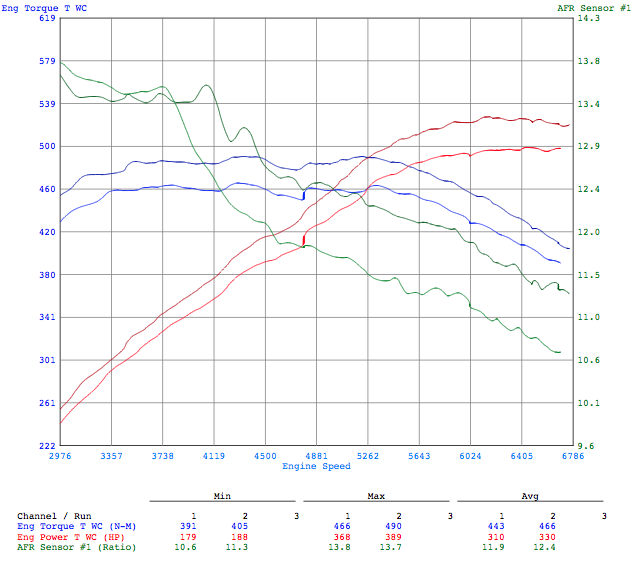 The results on the dyno whilst impressive, considering this car was already tuned, are only half the story. Massively quicker gear shifts and much quicker torque convertor locking really let this C63 launch off the line far quicker than it did before. The graph below shows the gains at the wheels with our software installed, along with the vastly improved AFR. The Engine and Gearbox software whilst having had some adaptation time on the dyno, will now continue to adapt over the next few hundred miles on the road. The ECU and particularly TCU will continue to adapt and we fully expect a few more horsepower and even better shift speeds once there is some mileage on the car. If you’re interested in our C63 AMG Engine and Gearbox tuning solutions, do give us a call on +44 (0)1795 342006 or email info@jrtuning.co.uk. We can supply C63 AMG performance software worldwide through the use of our hand-held OBD flash tool, allowing us to post out a tune to you for you to install in a matter of minutes. We can even tailor the software to include corrections for different exhausts or headers (etc)… or even better, book us for some dyno time here in Kent and see the results for yourself! This entry was posted in General and tagged amg, amg gearbox, amg gearbox software, c63, c63 amg, c63 gearbox remaps, c63 remapping, c63 tuning, ecu, ecu software, ecu tuning, gearbox remap, gearbox remapping, gearbox software, mercedes c63 amg, mercedes remap, mercedes tuning, remap, tcu, tuning. Bookmark the permalink.